ReFS is natively avilable in Windows Server 2012/R2 and above and is supported on Windows 8.1 and above. So, if you have server 2008/R2 then you need to upgrade to new Server OS to use ReFS. Note: ReFS is not supported on Windows XP, Windows 7 and Windows 8 so if you have client image with these OS, you need to use new image with Windows 8.1 or Windows 10. 1. In Server 2012/R2, open "Disk Management" and format your disk with "ReFS" file system (Figure 1). Note: You cannot use ReFS for OS system partition as Windows doesnot support booting from ReFS disk/parititons. 2. Format all your disk to ReFS file system (Figure 2). 3. Once done, in CCBoot Disk Manager assign each disk based on its use (Figure 3). 4. ReFS has data integrity which ensures that files are protected from errors and available when needed. This is very useful if you frequently have lights out and server goes down as well. ReFS protects disks data from being corrupted so you can carry on with running your cafe without any down time. Note: Its best practice to prevent Server from shutting down spontaneously to prevent disk damages. 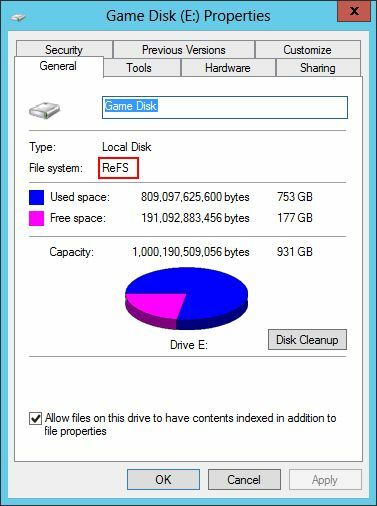 Few things to consider before using ReFS file system. 1. 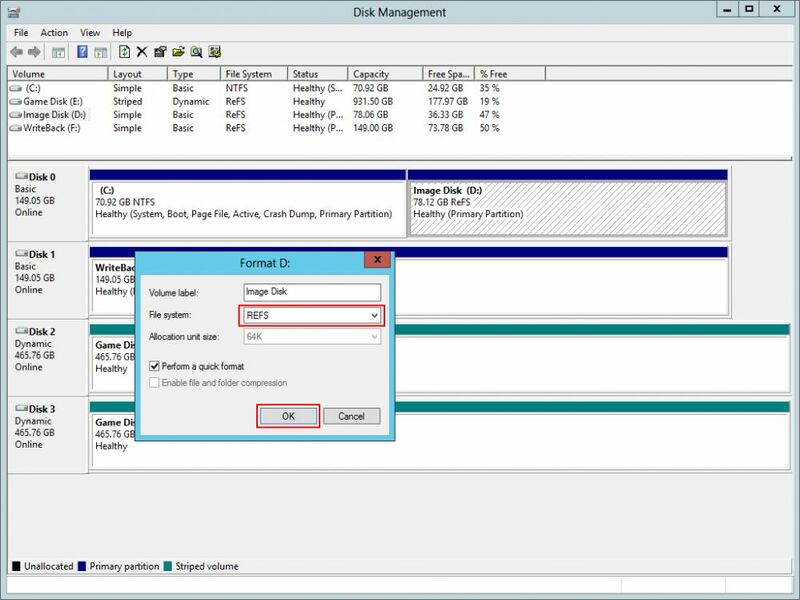 You cannot go back to NTFS without losing data or moving the data. 2. Windows Server 2016 has ReFS 2.0 which is slightly better than on Windows Server 2012. 3. 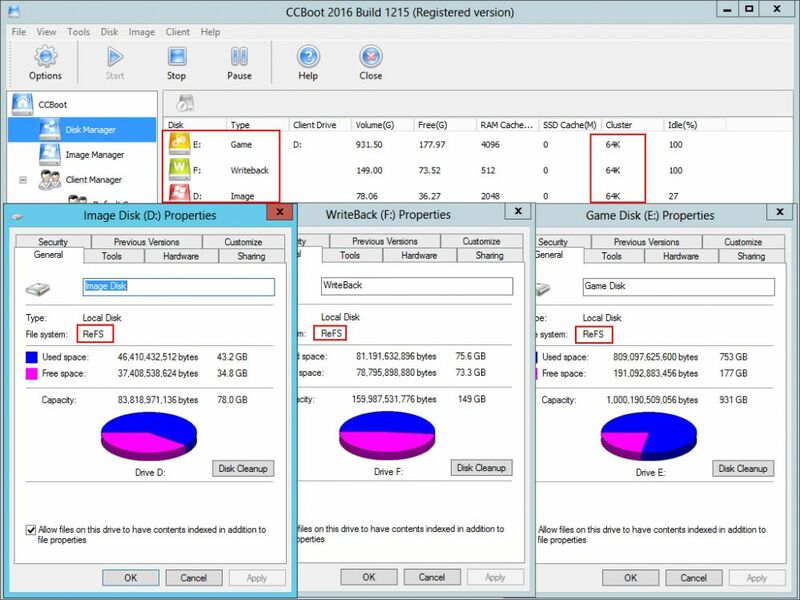 You need to use storage space to create RAID if you want to have file integrity on, RAID created from Disk management do not have file integrity.